No church is mentioned here in Domesday. 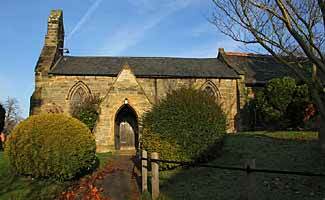 This small stone church serving Sutton is set back from the road on a hillside. It is Early English and consists of a chancel, a nave of three bays, north aisle, north vestry, south porch and west bellcote with two bells. The earliest parts are 13th century. These are the north arcade with circular and octagonal piers and moulded capitals, and the aisle belonging to it. The chancel cannot be much later judging by one of its windows. The nave must be early 14th century. There is a square-headed piscina niche in the chancel. The 14th century octagonal font with quatrefoil panels is similar to the one at St Michael’s, but without the three projections. The church has a fine carved reredos of stone and alabaster. Three of the stained glass windows are by Kempe, dating from 1897 and 1901. In a recess in the chancel is an alabaster effigy of a knight in armour, c1475 with Yorkist collar of suns and roses, feet resting on a lion. Thoroton suggests it was of a member of the Staunton family.